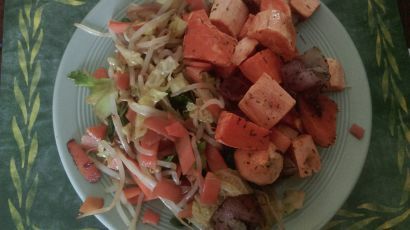 Sweet Potato and Stir Fry – Create, Make & Bake! Quick and easy dinner, not very difficult. Ill probably do it again very soon. The hardest part is probably not getting spat at while cooking the stir fry. 1 Pack of stir fry, or make up your own. 1. Chop the sweet potatoes to about 1 1/2 inch thick chunks. Slice the bacon to short 1 inch strips. Preheat oven to gas mark 6/ 200*C/400*F.
2. Place the potato and bacon on a baking tray, mix in the thyme and sprinkle on the salt and pepper. Bake for 15 minutes, then mix around. Bake for another 15 minutes. 3. During the last 15 minutes, heat up the oil in a wok, or a large frying pan. Put all of the stir fry in the wok/pan and cook on a high heat for 5 minutes. Put to on side until the potatoes and bacon are done. Serve together and enjoy.